Stimulus only : Contains only the stimulus driver and design under test. Full test bench : Contains stimulus driver, good results, and results for comparison. Simulator specific : Test bench is written in a simulator-specific format. Hybrid test bench : Combines techniques from more than one test bench style. Fast test bench : Test bench written to get ultimate speed from simulation. To show the different types of test benches, a common example is used. To make it simple to understand the stimulus and response, a counter example is used. In VHDL designs the testbenches are normally used only for the simulations. In the simulator instead of forcing the signals to the design under test, the stimulus is applied using the testbench. In order to write the testbench the design under test is considered as a component as declared in the structural modelling. Further, the test vector Stimulli is applied using the signals. Normally the testbench is not synthesizable code because it contains the information related to the time delays. 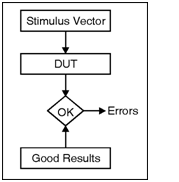 Since the design under test do not includes the timing delays the VHDL code written for design under test is synthesizable. Consider the example of synthesizable and not synthesizable testbench for AND gate.